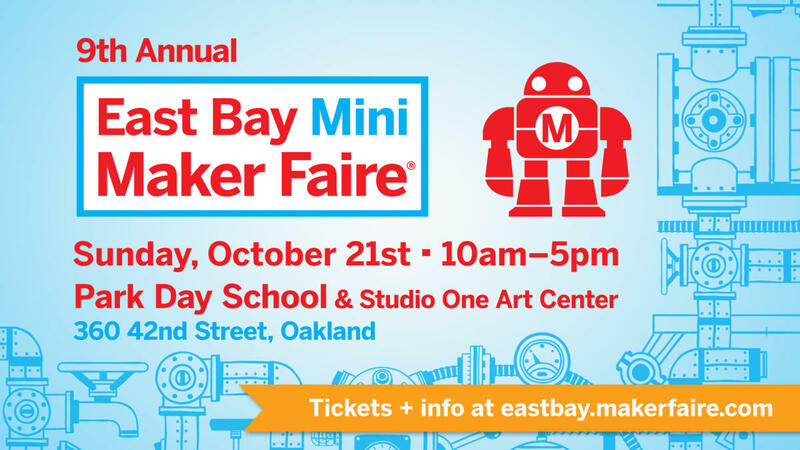 The 9th Annual East Bay Mini Maker Faire will happen in Temescal (at Park Day School and Studio One Art Center) on Sunday, October 21st. 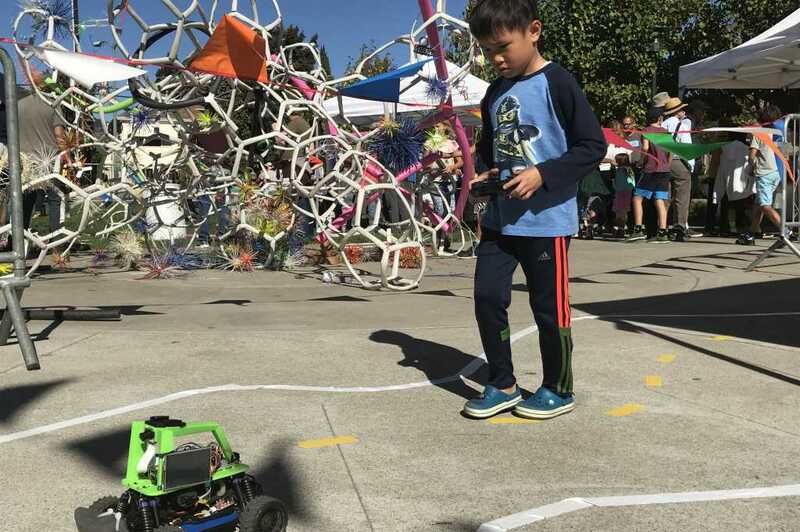 The East Bay Mini Maker Faire continues to be a largely volunteer-driven event, with well over 100 parent volunteers from Park Day School making this amazing event happen for over 120 makers and 6,500 visitors. The first East Bay Mini Maker Faire was held at Park Day School and the Studio One Art Center in 2010, as a community event and fundraiser to help to fund the school’s financial assistance program. The fully interactive event is a reflection of the school’s hands-on, project-based classrooms. This one-day, family-focused Faire brings together potters wheels and robotics, circuits and origami, music, dance, pedal-powered carnival rides, and 3D printing in a hands-on celebration of creativity, artists, engineers, crafters, and urban farmers from across our local East Bay communities. 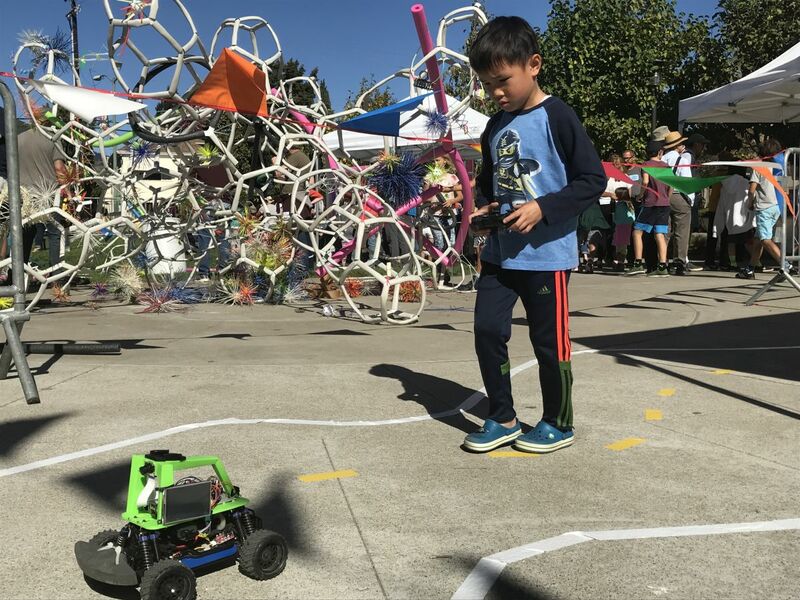 The East Bay Mini Maker Faire is “mini” only because it’s smaller than the 100,000-person, three-day flagship Maker Faire Bay Area held in May at the San Mateo County Fairgrounds. The Oakland event is one day and attracts more than 6,500 people of all ages, and makers from around northern California. The Faire’s variety of booths allows Faire-goers to be as hands-on or hands-off as they want. The outdoor stage offers dance battles and performances, while other makers show off their solar vehicles, and sound-responsive LEDs. Anyone can get their hands on a soldering iron, shape alabaster by hand with sandpaper, or take a ride on a Frankentrike. Other exhibits last year included a human-scale hamster wheel, youth-hosted bubble experiments, a BMX quarter pipe, competition robots, origami lessons, a homemade race-car simulator, quilting, ceramics, leather work, and ham radio operations. The East Bay Mini Maker Faire is a natural extension of Park Day School’s project-based, hands-on, interdisciplinary K-8 curriculum. In all of Park Day’s classes, students develop a deep understanding of the methods and processes for finding and solving real-world problems, and constructing creative solutions to design challenges across the range of subjects and grades. Park Day School's academic program is driven by an enduring respect for children as thinkers and explorers, imaginative writers, curious scientists and mathematicians. Rather than relying on standardized testing or normative standards, Park Day inspires the intellectual growth that arises from a program focused on learning for deep understanding–where students’ sense of hope, imagination and inspiration inform how they best engage with the curriculum. Look in any classroom and you will see students resolving complex mathematical challenges, conducting scientific experiments and developing their skills with language, history and the arts. A foundational element of Park Day’s progressive model involves fostering in students an awareness of the injustices that exist in our world in an age-appropriate way. A kindergartener may notice that a classmate needs a friend, a fourth grader might defend a classmate from teasing, or an eighth grader might participate in anti-poverty march—in each instance, there are important opportunities for discussion, learning, and growth. As a progressive school for over 40 years in Oakland, Park Day has always worked to prepare children with the skills they'll need to thrive in the 21st century and make our community, and the world, better. Price: $15 for kids/seniors/students; $19 for adults with advance purchase.